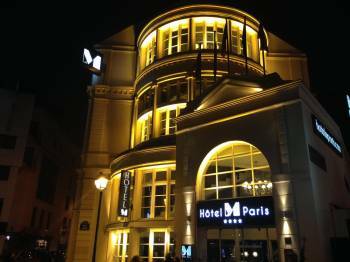 The Hotel Le M is located right in Paris cultural centre, in the district of Montparnasse, within easy reach of the Quartier Latin and the Jardins du Luxembourg. Offering fast access to the Montparnasse Bienvenüe and Gaîté Metro stations. Decorated in a contemporary, modern style with a homely atmosphere. The hotel has two rooms with natural light and direct entry, making it an exceptional venue for your events and meetings, etc. In addition, they are equipped with audiovisual equipment and a Wi-fi Internet access to ensure that your event goes perfectly in the unforgettable City of Light.No matter what kind of event you wish to arrange, please do not hesitate to contact us. We will offer you the best service. With Abba Hotels, planning a congress, convention or incentive event is very simple if you leave it in our hands. It will be a success because we are an enterprising company with modern and functional buildings. We always aim for excellence in our service and customer satisfaction. The Hotel Le M is the ideal venue for work meetings, company conventions or product and service presentations. Our meeting rooms are equipped with the latest technologies, including Internet access, to ensure that your meeting is a success. No matter what the event, ask us and we would be delighted to help you arrange it.